By now you know “TrackTown LIVE” is back for its 4th year in a row. The joint venture between the U.S. Track & Field and Cross Country Coaches Association (USTFCCCA) and TrackTown USA to preview the NCAA Division I Outdoor Track & Field Championships on a live webcast began in 2014 and continues strong into 2017. This year we’ll preview the men’s championship on Monday, June 5 between 6:30-8 pm ET. Then it’s the women’s turn on Tuesday, June 6 between 5-6:30 pm ET. All of the proceedings will be broadcast on Facebook Live through the TrackTown USA fan page. We’ll be sure to share links on our Facebook fan page as well. The 2017 NCAA Division I Outdoor Track & Field Championships begin Wednesday, June 7 and run through Saturday, June 10 and we don’t think there is a better way to get to know the future stars of the meet than by hearing from them during “TrackTown LIVE” on Monday and Tuesday. We also implore you to watch NCAAs across the ESPN family of networks, especially on Friday and Saturday as they’ll be shown in prime time on ESPN. 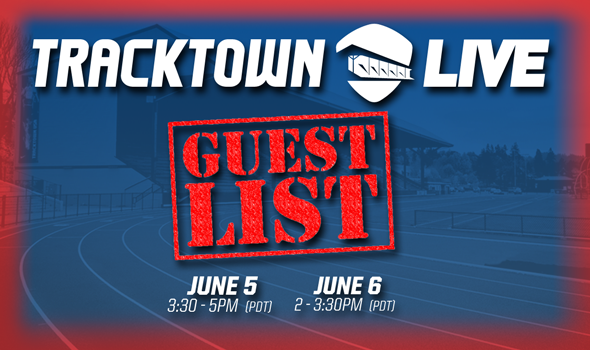 But first, you should check out “TrackTown LIVE” and its star-studded lineup that features three Olympians and athletes who won a total of 7 NCAA titles at the indoor meet back in March. Here is the order in which the men will appear on Monday, June 5. Here is the order in which the women will appear on Tuesday, June 6. Charlotte Taylor, San Francisco, with head coach Helen Lehman-Winters. Collegiate track & field fans can also expect to hear from TrackTown USA president and 2016 Men’s Olympic Track & Field head coach Vin Lananna and USTFCCCA CEO Sam Seemes, 2016 Olympians Devon Allen and Jenna Prandini, as well as experts from FloTrack and RunnerSpace.